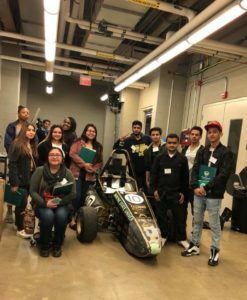 In addition to preparing their research projects and presentations for the Southeastern Michigan Regional Junior Science and Humanities Symposium (JSHS), high school students in the Wayne State College of Education Upward Bound Program (COE UB) spent their summer learning about a variety of STEM careers available right in their own backyard. While the broad focus of JSHS is to give high-achieving students the opportunity to present their long-term research project to STEM professionals and their peers, the Strategic Outreach Partnership between AEOP’s JSHS and the COE UB program focuses on connecting high school students with research mentors and promoting opportunities for the students to engage in authentic research. After participating in COE UB, these students are well-prepared to begin their research with the aim of presenting at the final showcase, JSHS in March! Developing contacts with students earlier in their research process enables us to build a stronger relationship with JSHS participants over time. Last summer, students toured Wayne State University’s Mortuary Science Laboratory. They heard about careers in mortuary sciences from funeral services professionals. They got out of the lab and into the field for biodiversity data collection at Lake Muskoday in Belle Isle State Park, learning how to collect algae on a slide properly. 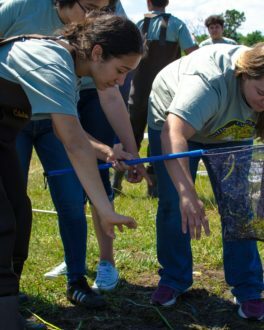 Students learned about pollination from urban beekeepers from Bees in the D. They learned how scientists measure drinking water quality at the Regional Detroit Water Treatment facility. They visited the WSU Planetarium and the University of Michigan Wind Tunnel Research facility. Through these activities, students were exposed to a variety of STEM career paths and ask questions about their day-to-day work life and their academic background that prepared them for their profession. Students were able to network with potential STEM mentors and cultivate their curiosity as they prepare a research project for the next JSHS. Wayne State University is the proud host of the Southeastern Michigan Regional Junior Science and Humanities Symposium for the 55th year in 2019. 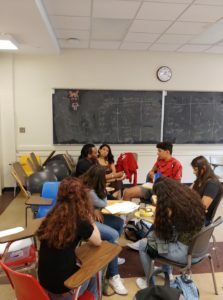 Wayne State College of Education’s Upward Bound program is a rigorous, pre-college academic preparation program that serves high school students. Sandra Yarema, Ph.D., is a lecturer in Science Teacher Education at Wayne State University College of Education. Sandra has more than 20 years’ experience as a certified middle school teacher. 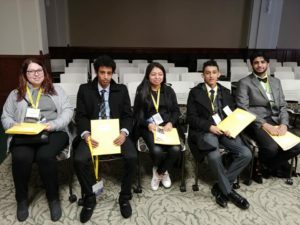 Twenty-One students from the COE UB, along with sixteen other students from across Michigan presented their research projects at the JSHS on March 8. STUDENT ORAL PRESENTATIONS (6 COE UB students presented their research orally). What Do Insects Prefer to Land In? Do humans and dogs share the same amount of bacteria in their mouth? Evaluation of Biomedical Career advancement program 2018: A Study of high school student’s perceptions. Water Crisis: Pros and Cons of Water Filtration in the Great Lakes States and Abroad. The top 3 Regional finalists were awarded scholarships: $2,000 for 1st place, $1,500 for 2nd place, and $1,000 for 3rd place. The teacher of the 1st place finalist is also awarded $500 for their school. The top 5 finalists are invited to compete in National JSHS, April 24 – 27, in Albuquerque, NM, all expenses paid. First and Second Place will present their research orally, additional scholarship prizes will be awarded at National JSHS, in each STEM category: $12,000 for 1st place, $8,000 for 2nd place, and $4,000 for 3rd place. 3rd – 5th place finalists will present posters, scholarship or cash prizes in each STEM category will be awarded. 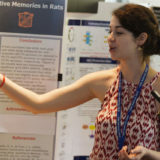 At Junior Science and Humanities Symposia (JSHS) high school students compete for scholarships and recognition by present­ing their results of STEM projects to a panel of judges.